When you are looking for the three most coveted features of any good restaurant like its location, quality of food and friendliness in service, The Cliff can easily be in the list of top five in Langkawi. 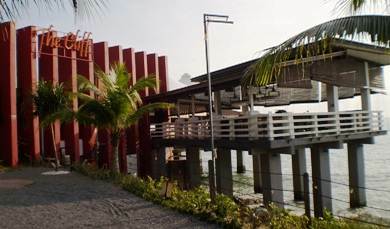 The restaurant is located at the southern end of Pantai Cenang just behind the Underwater World. An alleyway leads down to the restaurant which is otherwise not visible from the main road. However at the entrance to the alleyway, there is a large board that displays the full and exotic menu with many innovative dishes with their prices. All the innovative dishes are creations of the Chef Khairul who has won the national culinary competition 'The Culinaire Malaysia' in 2005 and 2009. The Malay and Continental dishes with innovative twist along with great presentation can itself make the day for you. Often you will find passerby standing by the large board looking at the amazing menu and then staring through the alleyway trying to get a glimpse and understand what is this place after all. If you walk down the alleyway, you will find the restaurant perched on a cliff with a panoramic views of the sea, the islands offshore and almost the full stretch of Pantai Cenang Beach. This is the same cliff with high rocky formations that separates Pantai Cenang from Pantai Tengah beaches. And the restaurant sits right at the middle of the two and high on a cliff ... what a location!!! If you are targeting the sunset (around 7pm), then initially go and sit in the bar section to enjoy some of the innovative cocktails they serve or just have a chilled beer. The bar named as D'Reef can seat about 40 persons. It has a roof cover but open from all sides. No matter where you sit, you get sweeping views of the water and enjoy the gentle sea breeze. This is undoubtedly one of the best places to enjoy spectacular view of the sunset. Some of our favorite cocktails are the espresso-martini and romantic poison rose. You can then move into the spacious dining area which can easily seat about 120 persons. As you can see in the picture above, the dining area is modern with metallic beams in the ceiling holding a semi-transparent roof. 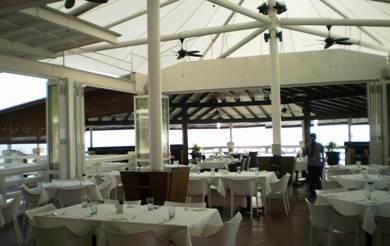 The dining tables are all covered with spotless white table cloths and white colored chairs giving it an upscale look. If you plan to watch the sunset views from the dining room and take the best ocean side table, then you should make reservation in advance. There are only couple of tables that enjoy the best views from the dining area, although other tables too have nice views. The dishes have been innovatively named by the chef with great humor and passion. One of our favorite starters at The Cliff is Pulau Payar named after a small island of Langkawi archipelago. It's tamarind marinated crisp fried Ikan (fish) kurau in bite sized portion and served with sweet chillies, cubed pineapple compote, curry leaves, nuts and coriander leaves. Ideal to have it with some wine or chilled beer. Another great starter is the 3-Sekawan (meaning three great friends of the sea). This is a seafood platter that comes with three different seafood - grilled baby octopus, breaded fish fillets (garoupa) served with a sauce and a mini serving of grilled baby lobster. This dish is served on a bed of cucumber capers salad. You can also start with The Cliff Caeser Salad (RM28) which is served with king prawn, beef bacon along with lettuce and other ingredients. Another excellent dish is the Udang Sungai Kilim which comprises of King Prawns caught at the local rivers and served with thin slices of deep fried banana dipped in curry masala gravy. But our most favorite main course dish here and probably the most popular with the returning diners is The Cliff Redang Tok (RM48). It is traditional braised beef served with galangal, ginger, lemongrass, turmeric, chilli and coconut. This is like a traditional beef stew and goes excellent with the accompanying pickle. It is served with spiced rice with cashews sprinkled over it. This is the signature dish of The Cliff. But there are many other choices and the menu is really elaborate. Some of our other favorite main courses are Kambing Teluk Nibong (RM68, braised lamb shank served in spiced coriander, tomato and yogurt gravy), Ayam Tok Janggut (RM68, duo baked chicken with antawada sauce, wok fried fresh water prawn), Daging Halia (RM48, very popular stir fried beef with ginger, asparagus & carrot). Often complementary house wine is offered along with your meals. Not many notice that there is another section in the restaurant area called Waves. It's an open area along the water line and complete with tables, chairs and orange umbrellas. This seating area can accommodate 60 persons and offers a romantic setting for couples. It's outside the main restaurant area and along the stretch that leads down to the Cenang beach. Overall, the service is very friendly and the staffs are well trained. We have been to this restaurant several times and never came back with any complaints. Serves Lunch & Dinner. Daily 12noon to 11pm. Credit cards accepted. Lot 63 & 40, Jalan Pantai Chenang, 07000 Pulau Langkawi, Kedah Darul Aman. The Cliff is located at the southern end of Pantai Cenang and behind the Underwater World. A narrow pathway from the main road leads down to the restaurant.